This easy slow cooker recipe takes jarred pasta sauce and combines it with Italian sausages, garlic, peppers and onion. If you have the time, make your own sauce and use it instead! 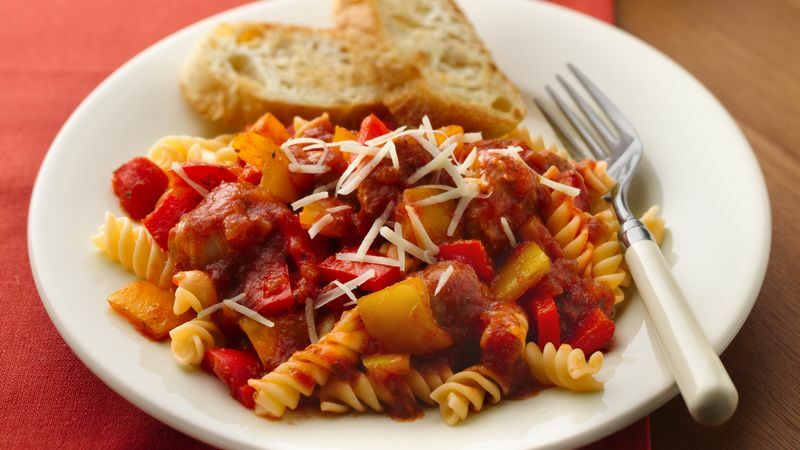 Add all ingredients except the pasta and Parmesan cheese to a 5- to 6 1/2 -qt slow cooker bowl. Cover and cook on low heat setting 6 to 8 hours. Cook and drain pasta as directed on package. Serve sausage mixture over pasta; sprinkle with Parmesan cheese.